Impressively, most teams managed to retain a relatively tight rear end despite track temperatures peaking at 61.4 degrees Celsius. If we compare how open the bodywork was this time last year there is clear evidence that this year’s power units are another step forward in terms of efficiency. Closing up bodywork reduces drag and allows the aerodynamics to work at their maximum potential, rather than being disrupted by hot air vents and larger outlets. Ferrari were the most impressive at keeping their car cool without opening up bodywork and this can be put down to their neat radiator packaging and the power unit’s increased efficiency. Normally the radiators are angled upwards around the car centreline (i.e. angled upwards when viewed from the side of the car), the degree of which depends on what the team want to do with the internal flow and how they want to shape the sidepods around them. The objective is to push as much air as possible through the core of the radiator without it losing much energy and creating boundary flow – this induces drag and doesn’t maximise the potential of the power unit. Ferrari have done this and also opted to incline the radiators outward of the car centreline (i.e. angled upwards when viewed from the front/back of the car). The above illustrations combines the two angles around their respective axis’ together. The advantage of this is that they can create a much nice shape to the shoulder of the sidepod – you will note that the SF15-T’s sidepods are quite rounded and reasonably undercut. However the drawback is that the air entering the sidepod inlet has to turn slightly (rather than pass straight through) to reach the entire surface area of the radiator. Such is the shape of the inlet that boundary layer flow builds up as the air attempts to take the path of least resistance, thus reducing the cooling capacity of the radiators and generating unwanted drag. To counter this Ferrari have small guide vanes ahead of the radiator to turn flow into the core. The back is lined with pairs of fins, too, which has been made out of a carbon fibre panel that can easily be removed for maintenance work. This significantly enhances the internal aerodynamics of the car, to such an extent that there was no need to open up the rear bodywork at all between Melbourne and Sepang. Two small slots were made into the removable panel by the driver’s head/cockpit area, but nowhere near the array of gilled outlets we saw on the Mercedes-powered cars in particular. Aside from cooling, a small revision was made to the front brake duct. 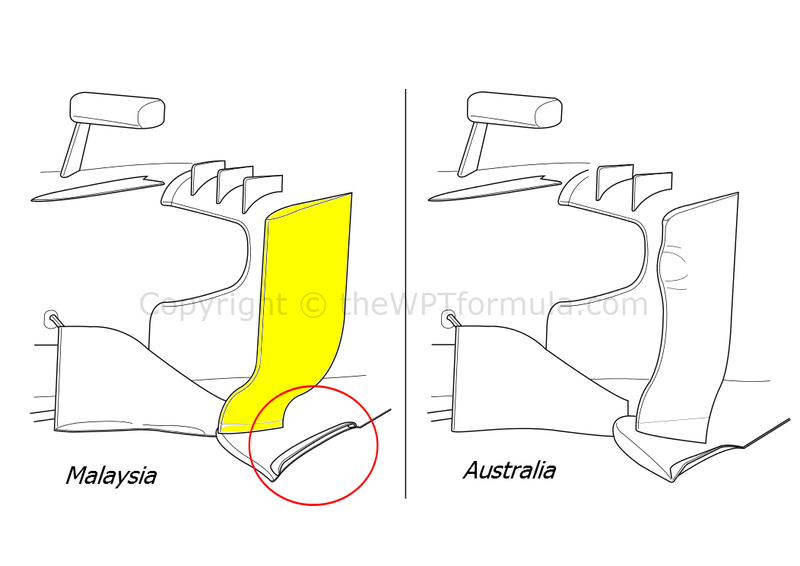 A slot was introduced at the leading edge of the guide vane to condition flow around the front tyre/suspension area. As the McLaren-Honda begin to get to grips with their power unit, attention has been diverted slightly towards the chassis. A substantial aero update was brought to the MP4-30 for the weekend, including their own spin on the S-duct. Unlike the other solutions we have seen over the past three years, McLaren’s splits the exit of the duct into two channels that pass out eitherside of the Pitot tube stack that towers above the chassis top. This is an effective design as the air being fed through the duct will be less turbulent as a result of the reduced blockage at the exit. The packaging of the duct within the front bulkhead is also very tidy, which will help the mechanics out when it comes to setup changes. As a result of the new S-duct, the vanity panel that covers the abrupt change in chassis\nose height has been modified to accommodate the exit vent. The overall appearance of the chassis top is much smoother as a result so it appears as if the S-duct was always in the pipeline for the car at some stage. Work was also made around the sidepod inlet region. 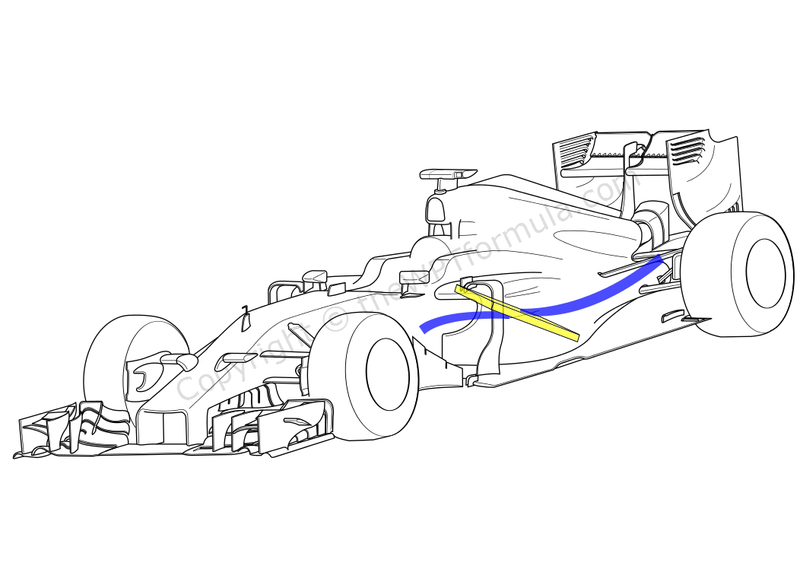 This area is numerous responsibilities: feeding the radiators with clean airflow, blocking front tyre wake from the sidepod’s undercut and dispatching the Y250 vortex (generated off the front wing) around the sides of the car. Highlighted is a new conditioning vane. The crinkled leading edge has been replaced with a straight, vertical surface and the base of the vane has been moved inwards to meet with the bargeboard’s trailing edge. The bargeboards themselves have had some subtle detailing done to them at their lower edge, which is a trend across the grid this year. Circled are the extensive changes to the floor, which now features a more up-to-date scrolled profile complete with Gurney flap on the top side to induce a greater pressure delta between the upper and lower surfaces. This generates vortices along the edge of the floor, preventing the low pressure beneath the car from leaking out and allowing a higher rake angle to produce more rear downforce. Finally, a third vortex generator has been placed on top of the sidepod to encourage air down the sidepod towards the top of the diffuser. Also worth noting is that McLaren have a blunted rear axle as well as on the front. Unlike the front axle, though, the rear is not being blown with air through the brake ducts. The reason for its flat face is so that the pit crew can use the same wheel gun at both the front and rear if necessary. An impressive technical feature that went under the radar in Australia was Toro Rosso’s new rear wing pylon, which was evident again in Malaysia. Instead of forming an inverted ‘Y’ shape around the exhaust, the carbon fibre pylon instead passes straight through the exhaust to meet the rear crash structure below. There must be a transition between the main carbon fibre pylon and (probably) a titanium support within the exhaust itself to resist the gases’ heat. Clearly there is little performance loss in placing a form of blockage within the exhaust stream at the exit, which prompts the thought of whether Toro Rosso are able to do some neat rear wing flexing around the single pickup point with the rear crash structure, rather than the two wide-stanced pickups a Y-lon offers.